There are some big changes happening in my life lately. Some good and some not so good. But one of the most exciting things going on is that I have my first fabric line coming out with Cloud9 Fabrics next spring! I am so grateful to be a part of the Cloud9 family, they are such a great company to work with! You can read my designer bio on the Cloud9 website here. The collection is called Brush Strokes and will be shipping to stores in June. 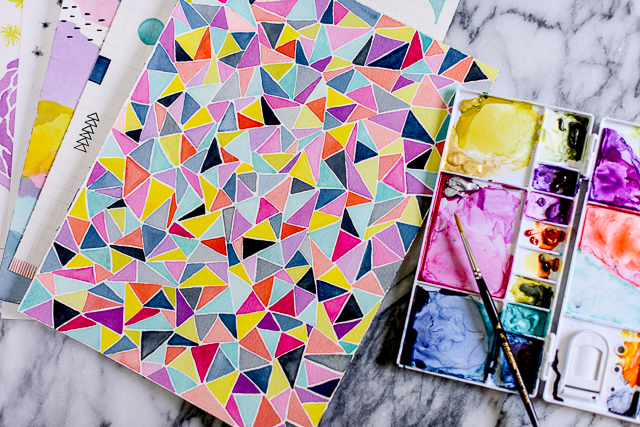 Brush Strokes is a playful collection of graphic blooms and geometric prints painted in vivid shades of watercolor. It includes 16 prints on organic quilting weight cotton. It also coordinates really well with Cloud9's Cirrus Solids. I'll give more details on that in the spring! I had so much fun painting all of these patterns! I can't wait to see them on fabric. Thanks to Cloud9 for such an amazing opportunity! I will have the collection available to purchase once it's released. If you're a fabric shop owner looking to purchase the collection, please contact Cloud9 Fabrics to order! Wow, Holly these are gorgeous fabrics. Congrats!!! Gorgeous!!! Can't wait to get my hands on some!